We’ve all been there: it’s late spring, and you walk into the garden center to buy your summer annual plants. You think you know what you want to purchase, but suddenly you’re overwhelmed. There are plants everywhere, and each species has seemingly countless cultivars. You thought you wanted pink New Guinea impatiens, but there are so many options to choose from! How are you supposed to pick only one of the endless varieties of coleus? And what if you accidentally buy plants that look great in the greenhouse but don’t perform well in your gardens and containers? Annuals are expensive -- who wants to waste that kind of money on plants you’re under-informed about?! Salvia ‘Lighthouse’ series: These salvias produce large spikes of bright red or deep purple tubular flowers that stand tall over green heart-shaped leaves. At 24 to 30 inches in height, they have a strong presence in a garden border -- or they can anchor container plantings with their showy, high impact colors. ‘Lighthouse’ salvia are heat and drought resistant, and no deadheading is required! Full sun to part shade. 'Jester' is an awesome focal point for containers. Pennisetum ‘Jester’: Ornamental millet is a tough and dramatic plant for large containers or garden beds, and ‘Jester’ is one of our favorite cultivars. Its chartreuse young foliage slowly matures into a beautiful bronzy maroon color. The plant resembles corn, with long broad leaves and prominent tassel-like seedheads that last from late summer into fall. In full sun and with regular watering, ‘Jester’ is almost four feet tall. It’s excellent in windy conditions, such as rooftop gardens. 'Silver Stream' spills daintily out of the front of these urns. Lobularia ‘Stream’ series: Before you dismiss sweet alyssum as a boring old-fashioned annual, take a peek at the ‘Stream’ series. We planted ‘Purple Stream’ and ‘Silver Stream’ this year, and they were so pretty! Whether planted in sun or partial shade, they are heat tolerant, vigorous growers that are constantly blooming with fragrant flowers. With their mounding and trailing growth habit, they’re an ideal reliable “filler” for any pot. 'Bounce Bright Coral' impatiens add season-long color to a perennial border. Impatiens ‘Bounce’ series: With the unfortunate downy mildew epidemic affecting our usually reliable bedding impatiens, growers have been cranking out new hybrid impatiens that are disease resistant. The ‘Bounce’ series is a gorgeous hybrid that comes with bright flower colors such as cherry, white, pink flame, bright coral, and violet. They are an excellent mid-range height, reaching 14 to 20 inches tall and wide, so they’re large enough to make a statement without taking over your whole garden. They grow quickly in both sun and shade, though they’ll need more water in full sun. Impatiens ‘SunPatiens Spreading White’: Another excellent impatiens hybrid is the ‘SunPatiens’ series, and we especially love their ‘Spreading White’ variety. This plant has bold green and yellow foliage that creates a strong visual presence in the garden, even without its cute white flowers. ‘SunPatiens’ were bred for both sun tolerance and vigorous growth, and they definitely get much bigger than other impatiens. They have an upright, mounding growth habit and will get about three feet tall in ideal growing conditions! ‘SunPatiens Spreading White’ is a great substitute for (or addition to) coleus in a shady garden. Fuchsia ‘Tassel Dark Salmon’: One of our favorite container plants this summer was this foliage-centric fuchsia. Happy in sun or shade, ‘Tassel Dark Salmon’ has beautiful deep green leaves with maroon stems, which provide a harmonious yet contrasting backdrop for its tubular salmon flowers. Its upright growth habit (18 to 24 inches tall) is perfect for creating structure in your plantings. Although it’s pretty even without its flowers, the flowers attract hummingbirds and butterflies, too! Portulaca 'Colorblast Double Mandarin' is stunning in containers. Portulaca ‘Colorblast Double' Series: One of the most common problems we have with our clients’ container plantings is that they often don’t get watered enough. That’s why we were thrilled to find these ‘Colorblast’ moss roses -- they are wonderfully tough and drought-tolerant! They love sun and heat but don’t need constant babying. The plants trail happily over the sides of planters or along the ground, and the double flowers (in orange, yellow, or magenta) are large and eye-catching. Unlike other moss roses, the ‘Colorblast’ series will not close its flowers on a cloudy day. Coleus ‘Inferno’: This variety is one of the most vividly colored coleus we saw this summer. With its wide rich velvety reddish-orange leaves, ‘Inferno’ kept its bright colors in light conditions ranging from full sun to dappled shade. It's slow to produce flowers, which means less deadheading for our gardeners, and its mid-range size (14 to 28 inches tall and wide) is perfect for smaller spaces. 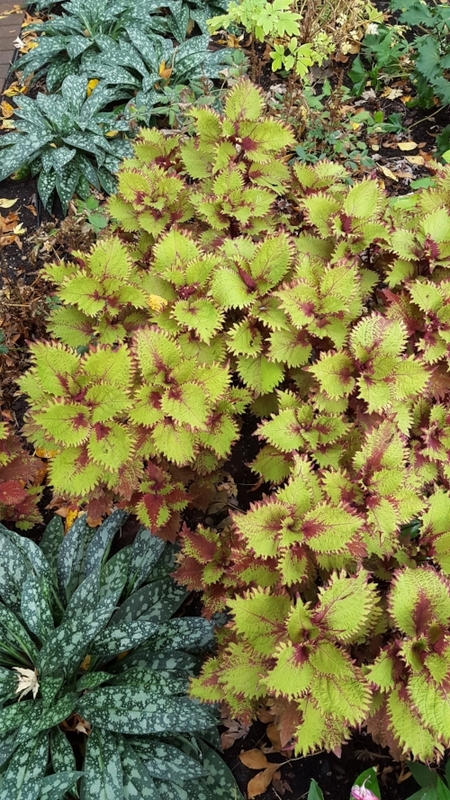 Coleus ‘Henna’: ‘Henna is another coleus we loved this year. It has curly, serrated copper-colored leaves that are backlit by deep burgundy undersides. (They. Are. Gorgeous.) It performs well in all light conditions and reaches 28 inches tall and wide. Little deadheading needed! Begonia ‘Unbelievable Tweetie Pie’: Although it has a silly name, this interspecific begonia is a hard-hitter. It’s a compact, semi-trailing plant that thrives in both sun and shade. Pale yellow semi-double flowers contrast cleanly with the plant’s dark green serrated leaves. ‘Tweetie Pie’ is very heat tolerant and long-blooming. Cordyline ‘Torbay Dazzler’: We’re always looking for the next big focal-point-plant to put in our containers, and cordylines are a must-have. However, in the past few years, we’ve had trouble with the wide-leaf varieties having their leaves shredded and battered by hail and windstorms. This year, the hail and wind barely disturbed 'Torbay Dazzler,' a narrow-leaf variety, and it has added strong color and structure to our annual plantings. ‘Torbay Dazzler’ has pointed leaves striped with green, yellow, and red, and it adds subtle drama with its height and brightness. Egyptian papyrus steals the show in these urns. Cyperus ‘King Tut’: Another great focal point for containers is Egyptian papyrus, a tall and graceful grass-like plant with flower tufts that resemble fireworks. This airy green giant will reach four feet tall in full sun and with consistent watering. ‘King Tut’ is a showy, fast-growing, and consistently healthy annual plant.